(Daily file photo by Katie Pach) Nia Robinson attacks a ball. The sophomore outside hitter had 48 kills at the Arkansas Classic. Down four points late in the third set against Butler, Northwestern was inching closer and closer to losing the set. Instead, the Wildcats battled back and took control. Despite losing freshman outside hitter Abryanna Cannon to injury and switching its system for the third time in three weekends, NU scored six straight points to take the lead. The Cats went on to win the set 27-25, and later the match. NU’s (7-2) four-set victory over the Bulldogs (1-8) was the highlight of its weekend in Fayetteville, Arkansas at the Arkansas Classic, which also featured a victory over Buffalo (6-3) and a loss to tournament-hosts Arkansas (6-2). The Cats dropped the first set of the match 25-23, but managed to take the second and third sets before blowing out the Bulldogs in the fourth and final set. Coach Shane Davis said he was very happy with how the team dealt with challenges during the contest. For the second straight week, NU used a 6-2 system during the tournament with sophomore setter Britt Bommer and freshman setter Kiara McNulty splitting setting duties. However, after the injury to Cannon, the team reverted to a 5-1 system. The Cats used the 5-1 system for the rest of the Butler match and all of the Arkansas matchup with Bommer as the lone setter. The California native compiled 30 assists in both matchups, which is the most in her career. “Our attackers were the most efficient off of her during the tournament at this point and we thought that was the best decision at the moment to go with Britt,” Davis said. In NU’s first game of the weekend, the Cats defeated Buffalo in four sets. NU lost the first set of the match, but recovered to win the final three as Cannon led the way with 18 kills. Sophomore outside hitter Nia Robinson added 17 kills and freshman outside hitter Hanna Lesiak smashed 10 kills with a .400 hitting percentage. Cannon was not the only player to get hurt while in Arkansas. Against the Razorbacks, junior libero Sarah Johnson sustained an injury during the first set of the game. Johnson — who entered the Arkansas game as one of four players to play in every set — did not return. 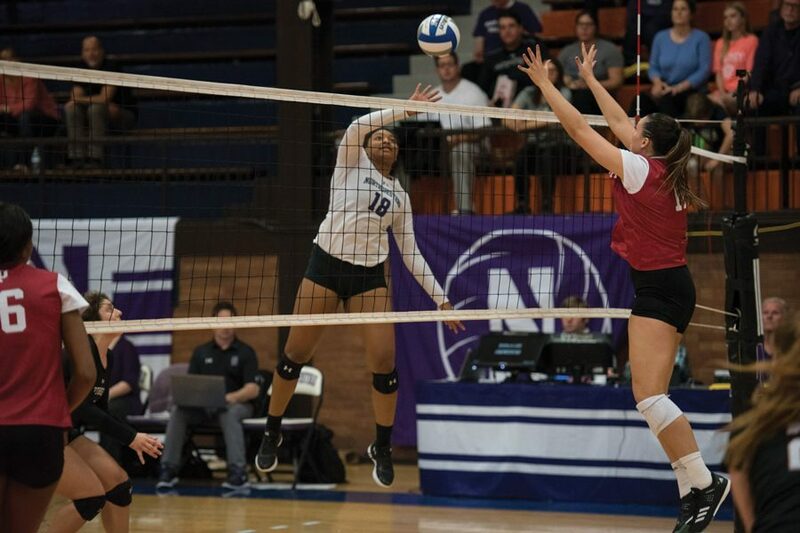 While NU fell in three sets to Arkansas, the team did dig 42 balls with freshman libero Michelle Lee providing 16. Robinson, who Davis said was a “rock” for the team this weekend, led the team with 11 kills.